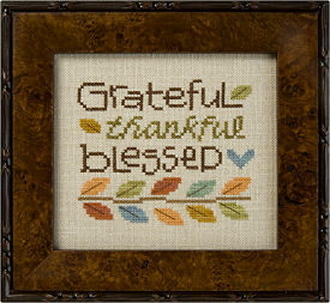 "Grateful Thankful Blessed". It's a great Thanksgiving design, but the sentiment works year round. Design size: 4" x 3.5". Stitch Count: 60 W x 52 H.
Model stitched on 30 count Lambswool Linen linen 2 over 2 (sold separately, see item 31-150). Instructions given for Weeks Dye Works threads with conversions given for DMC embroidery threads (not included).